Director Ivo Marloh’s documentary comes garlanded with an impressive collection of awards from festivals in Ireland and America. 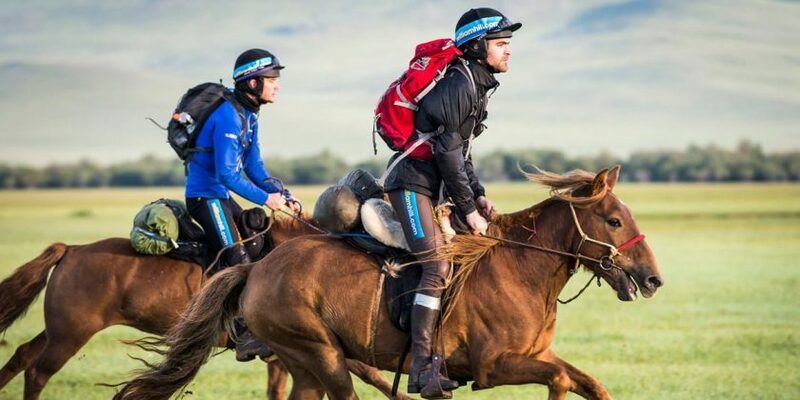 He and his team demonstrate not only skill but sheer endurance in their achievement of documenting the Mongol Derby horse race in Mongolia, the longest and toughest horse race on Earth over one-thousand kilometers of Mongolian steppe. The race has been going now since 2009 and uses what was until the forties the Mongolian postal system. 27 horse stations along the way where riders change horses, as the postal riders once did, and medical and veterinary teams check and treat both human and equine species for injuries. The Wild Mongolian horses themselves are descendants of Genghis Khan’s “weapon of choice” through which he built his empire. Lacking the aristocratic appearance of the Western race horse, they are tougher in physique and nature and totally beautiful. Although herded by the nomadic Mongolians, they are still wild, some have never before been ridden. In one beautiful sequence South African horse trainer Monde Kanyana gently but firmly persuades a “virgin” horse to accept him as its rider. “He cares more about riding that horse than winning the race”, one of the team comments. At the opening of the film we meet some of the riders, who come from all over the world and all walks of life. Some are professional horse trainers or jockeys, but those taking part also include an Alexander technique teacher, a woman firefighter and workers from finance, IT and a variety of other professions. Certain characters start to take centre stage, as the story of the race unfolds, one such being Irish jump jockey Donie Fahy, who is racing despite a recent serious back injury. The tough and dangerous nature of the event is made clear on the very first day, when one rider is thrown and breaks his collarbone. American Devan Horn pushes herself so hard she ends up with what looks like life threatening heat stroke and dehydration, while another rider fractures three vertebrae in his neck. The race is not like a conventional race. Taking place over many days, it is more like an endurance trek, with the riders seen isolated or in small groups against the impressive landscape. In many ways that landscape, the horses and other animals and the Mongolian people themselves and the glimpses we get of their culture are more interesting than the riders. Kanyana, who has never before been out of South Africa, is the first black man the Mongolians have ever seen and therefore the subject of much friendly curiosity. Near the beginning, riders are warned to be wary of wolves. In one touching sequence a foal dies after being savaged by a wolf and the other mares gather round the mother, supporting her in her mourning. So who wins the race? For that you have to see the film. But it would be fair to say, while coming first is great for the winner, this really is one of those events where the taking part is what is important.